New Haven's Philo Bennett probably thought he was doing William Jennings Bryan a good turn when he left him $50,000 in his will. It turned out he was killing Bryan's political career. 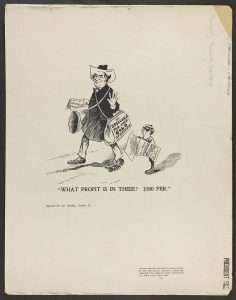 Political cartoon mocks William Jennings Bryan. Today we remember William Jennings Bryan, if at all, for his flamboyance. He was a publisher, lawyer and a populist politician who invented the modern idea of the presidential campaign trail. While prior politicians campaigned for the presidency by laying low and letting surrogates do the heavy lifting, Bryan created the tradition of the presidential stump speech. This, and his support for working class people, helped earn him the moniker 'the Great Commoner.' The three-time Democratic candidate for president gave more than 500 speeches in 1896 alone. Jennings career saw the Illinois lawyer rise to the House of Representatives (from Nebraska). He eventually served as secretary of state under President Woodrow Wilson, a position he resigned due to his inability to persuade Wilson to keep America out of World War I. His final contribution to American history was serving as prosecutor in the Scopes Monkey Trial in which a Tennessee school teacher was prosecuted for teaching the theory of evolution to school children in 1925. He won the trial and died days later. But the political tide that originally carried Bryan to prominence was the fallout from the financial panic of 1893. With America wrestling with a depression, two elements fought to control American monetary policy. Bankers and the wealthy leisure class preferred the tight money supply tied to the gold standard that restricted growth but protected their horded cash piles from inflation. Bryan and others, however, promoted a loose monetary policy that would have used silver as a currency to create more money to spur economic growth - and also inflation. Over his political career Bryan attracted many supporters (and enemies), but perhaps his biggest fan was New Haven businessman Philo Bennett. Bennett made his money as a food wholesaler. He believed Bryan's pro-growth policies would benefit American business and American citizens. He and Bryan developed a friendship when Bennett served as one of Connecticut's electors in the election of 1896. Bennett supported Bryan in his 1896 campaign and gave him $3,000 when he lost to assist him financially and allow Bryan to prepare for the 1900 election season. After Bryan again lost in 1900, Bennett traveled to Nebraska to visit Bryan. While there Bennett, Bryan and Bryan's wife drew up a will for Philo Bennett. With an estate of about $300,000, there was plenty of Bennett money to go around. Bennett left his wife, Grace Imogene Bennett, $75,000 in cash and the couple's homes. To the Bryans he left $30,000 for the purpose of endowing scholarships at 25 universities around the country. But Philo Bennett also left Grace a further bequest of $50,000 to be held in trust. He wished her to dispose of that $50,000 in accordance with instructions contained in a letter that was sealed up in a safe deposit box. That letter instructed her to give the $50,000 to Bryan. Bryan would later say that Bennett made the gift out of concern that Bryan's political involvement had hampered his career, making it difficult for the lawyer to adequately provide for himself. He had more than generously provided for his own wife, Philo Bennett reasoned, and he wanted Bryan to be comfortable in his old age. Philo Bennett was born in northern Connecticut and trained in Brookfield and Fair Haven to work as a tinsmith. In his early years he saved assiduously and eventually made his way south to New York City. He went to work for several wholesalers, shifting between New Haven and New York, and by 1900 he had partnered with Alfred Sloan Sr. Sloan was father to auto industry titan Alfred P. Sloan Jr. - and ran the prosperous firm of Bennett & Sloan. But Bennett's modest roots probably helped him relate to Bryan's populist message. Each summer, Philo Bennett's custom was to take a protracted summer vacation. In 1903 he traveled west to visit some mining properties he had invested in. Bennett died in Idaho. The brakes failed on a coach he was riding in and it tipped over, slamming him into a tree and killing him instantly. As the news reached the East, Bennett's will was read. It named his partner, Sloan, and William Jennings Bryan as executors. Bennett's unexpected death put a spotlight on the will. Though he had lost twice in his presidential campaigns, Bryan was still a leading figure in the Democratic Party. The story of the will had a couple of unsavory elements. First, the notion of a political leader accepting cash gifts from his patron smacked of corruption. But worse, Bryan himself had drawn up the will that would make him a wealthy man. And the language of the will suggested that Bryan was deliberately trying to keep the bequest private, suggesting he was ashamed of it. Still, Bryan might have gotten the money quietly and painlessly but for one other element in the will. Grace Imogene Bennett might well have handed over $80,000 to the Bryans - more cash than she herself received - if her husband Philo had not also left a $20,000 bequest to his mistress. The insult was one too many, and Grace challenged Bryan's right to act as executor. Bryan and Bennett had anticipated that Grace might challenge the will. Bryan was ready with a story. The $50,000 didn't represent a gift, rather the money was speaking fees. He had agreed with Bennett to deliver a number of speeches, and he would waive all fees since Bennett had already paid for them. The shabby affair gave Bryan's enemies ample ammunition and they gleefully played up the story of Bryan "robbing" a widow of her inheritance. In the end, the court concluded that the will did not place any binding requirement on Grace to follow her dead husband's instructions about the $50,000. She was free to do what she wanted with it. Had Bennett's will simply included a simple bequest of $50,000 to Bryan, he would have received the money. By structuring the will the way he did, referencing an outside letter, he lost it all and in a very public manner. Bryan made one final attempt at the presidency in 1908. He lost the election by his largest margin yet. Woodrow Wilson would receive Bryan's political support in the 1912 election, and he rewarded Bryan by naming him secretary of state. After resigning, Bryan would seek his fortune in Florida real estate. His opponent in the Scopes Monkey Trial was the famed defense attorney Clarence Darrow.